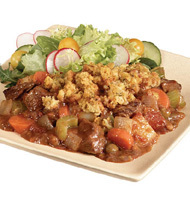 Topped with toasted cornbread stuffing, the flavors of this beef and root vegetable combination are intensified with the addition of tomatoes and balsamic vinegar. 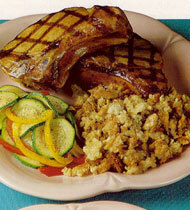 This is country comfort at its finest! beef for stew	 12 lb. 1. Preheat convection oven to 325°F. 2. In saucepot, heat oil. Add beef and garlic and cook until beef is browned. 3. Add vegetables and Italian seasoning. Cook for 10 minutes. A savory beef stock made with potatoes, carrots, seasoned beef, barley, peas and green beans. diced tomatoes, drained	 10 lb. 4 3/4 qt. canned potatoes, drained, diced	 4 lb. 2 qt. 4. Add soup, tomatoes, water, vinegar and potatoes. Bring to a boil. 5. Divide meat mixture among three 12 x 20 x 2-1/2 steam table pans.CCP: Cover and bake for 1-1/2 hours or until meat is tender and internal temperature is 165°F. Uncover and stir after 45 minutes. 6. Prepare cornbread stuffing according to package directions. Mix in cheese and Italian seasoning. 7. Uncover pans and divide cornbread mixture equally over meat, return to oven and bake until cornbread is browned and crisp. 8. CCP: Hold at 140°F. or higher. Cut each pan 4 x 8 into 32 portions (approx. 7 oz. 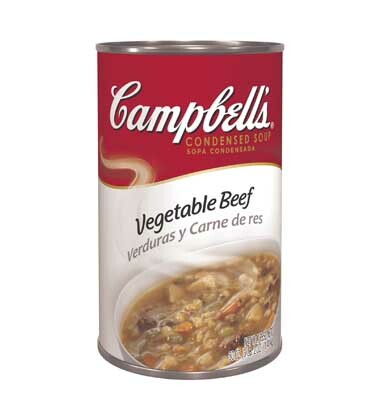 ).In step 5, this stew can be cooked on low heat in steam-jacketed kettle, covered and stirred occasionally.For a low-sodium version, use Campbell’s® READY to SERVE Low Sodium Chunky Vegetable Beef Soup. In step 4, omit the water and drain the canned tomatoes. diced tomatoes	 9.75 lb. 4 3/4 qt. canned potatoes	 4 lb. 2 qt.